I decided to explore my creative side after retiring, and have enjoyed taking classes at the CCAA. While visiting Australia I learned about the art of nuno-felting - a soap and water process of melding wool fibers into silk fabric to create a lightweight felt that can be used for clothing and decorative objects. It lends itself to a wide variety of creative designs and I have used the process mainly to make scarves. 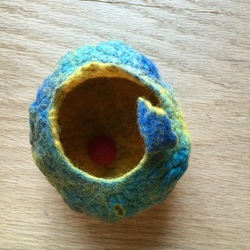 I have now completely fallen in love with the art of felting and have moved on to making felted creations such as bowls and jewelry, and using colorful wool fibers to make 'paintings'. There is something about the combination of the texture and feel of wool and the range of vibrant colors that I find totally irresistible as a medium to work with..... come to a class to learn more!